As an IRS Enrolled Agent (EA), I am licensed by the US government to represent Whittier taxpayers before the IRS, release and remove your tax levy and wage garnishment, settle your debt, prepare your back taxes, and help you achieve a fresh start. I work personally and confidentially with every client at a reasonable flat fee quoted up front and will get you the same resolution and relief as high-cost tax attorneys who charge $300–$1,000 per hour. I have personally represented 2,000 taxpayers over the past 20 years before the IRS. Only CPAs, tax lawyers, and Enrolled Agents (EA) are allowed to talk to the IRS on your behalf. Your CPA may know how to prepare your tax return, but he may not know all of the IRS and FTB resolution options when you can’t pay your taxes. I specialize in tax relief and resolution. 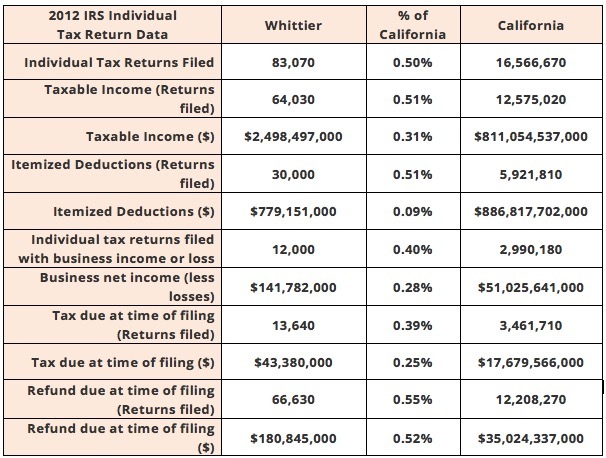 With 87,000 people living in the city of Whittier, it is certain that several hundred of them (and millions of people in the US) have IRS problems, such as tax levies, wage garnishments, property seizures, past due tax returns, unfiled taxes, and IRS tax audits. In addition, there are over 6,600 businesses in Whittier.1 Many of them also need tax help with or tax levies removed by the FTB, BOE, and EDD. It may seem easy to ignore the government’s demand for payment, but waking up to an empty bank account or house repossession is very difficult. The fact is, failure to file returns is a felony and subject to criminal and civil penalties. However, in my 20 years providing tax preparation and tax resolution services, the main reasons people need tax levies removed, unfiled tax return preparation, and other tax defense services is due to major life events, such as divorce, grief, unemployment, bankruptcy, medical, physical, and emotional issues, or simply procrastination and ignorance. Has the BOE sent you a demand for payment or placed a lien on your property for back taxes? In certain cases, the BOE will allow you to offer a compromise on the amount owed. Let a specialist in tax preparation and resolution for businesses with an A+ rating at the Better Business Bureau, represent your business at the BOE and negotiate a settlement on your behalf. Speak with me for a free, confidential consultation by calling 1-877-788-2937 between 8 am and 8 pm 7 days a week. Within 14.7 square miles, Whittier is home to about 87,000 people, with about 65,000 above the age of 16 and able to work.1 But 20,000 more tax returns were filed in 2012 than there are working age people.2 This likely means that about 20,000 unfiled tax returns were finally filed. Don’t get ripped off. Speak to a licensed and experienced enrolled agent to find out if you qualify for an Offer in Compromise and what other tax help is available to you. Remember that millions of people each year have unfiled tax returns, tax levies, and other tax problems, but that does not mean you can continue to not file. The sooner you file and resolve your IRS problems, the sooner your IRS fears, anxiety, and penalties will stop. US Census Quick Facts for Whittier, accessed March 2, 2015. SOI Tax Stats - Individual Income Tax Statistics - 2012 ZIP Code Data taken from IRS, Statistics of Income Division, Individual Master File System, updated July 2014, accessed March 2, 2015. SOI Tax Stats - Delinquent Collection Activities - IRS Data Book Table 16 – Delinquent Collection Activities for 2013, accessed March 2, 2015. The tax firm of Mike Habib, EA locally serves Whittier, Hacienda Heights, La Habra, Brea, Fullerton, La Mirada, Pico Rivera, El Monte, Santa Ana, Long Beach, Los Angeles, Beverly Hills and all of California.